Availability and reliability of your RF equipment is crucial for your business. We at DEV feel responsible for the success of your project also after having chosen DEV systems for the optical or electrical transmission of your RF signals. For all broadcast and satellite communications systems, in addition to our 7-year warranty, we offer the TripleC Protection, a comprehensive service package which is free for the first 37 months. For even higher security needs, we also offer the DEV Premium Service with exclusive benefits. With our 7-years warranty period* we promise that our products are engineered and manufactured for many years of use. 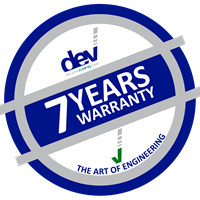 DEV Systemtechnik offers a long lasting 7 year warranty for all broadcast and satellite communications systems as well as the MODULO HFC platform*. Since we develop and manufacture our state-of-the-art products in-house, we can be absolutely sure that they are durable and have the highest reliability and lifetime. As a customer of DEV you gain high quality products from us, and also a unique service. By extending the warranty period we promise that our products are engineered and manufactured for many years of use. Additionally, all our products are covered by the DEV TripleC Protection for the first 37 Months. *currently excluded are all mechanical parts and power supplies. TripleC stands for Competent and Complete Care for your RF signals. This security package is included as standard for all broadcast and satellite communications systems and the MODULO HFC platform. It contains for a period of 37 months in case of failure free shipping of the equipment to and from the factory. TripleC Protection also gives you direct access to our technical experts and guaranteed service levels with defined reaction times for support and fault analysis. With the optional extension of TripleC after 37 months by another 12 months the service period can be extended up to 10 years in total. Watch for the TripleC Protection Sign – you should not settle for anything less! For installation or set-up, upgrades or repair: You can further increase your security, tailored to your individual needs with the DEV Premium Service. For high-availability applications, the optional DEV Premium Service gives you full protection – for contract periods from one up to 10 years dependent on the duration of DEV TripleC Protection. It offers free replacement unit in case of a failure, free firmware updates and guaranteed start of fault analysis in less than eight hours. DEV Premium Service can be ordered for all devices – even after delivery of the equipment. In case of already delivered equipment the Premium Service becomes effective 4 weeks after the order date of the service. Premium Service requires DEV TripleC.